Although we are primarily known for our one-of-a-kind custom instruments, we now also offer a line of standard guitar models. 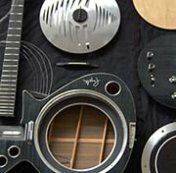 These have grown out of guitars that we’ve built without a specific order from a client, whether for a trade show or just to get it out of our system, and we’ve often had requests to build similar instruments based on these ideas. These guitars are pure Pagelli designs, instruments on which we were able to give our creativity free reign. 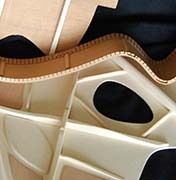 Even though they’re models rather than complete custom builds, these guitars can be ordered in many possible variations. 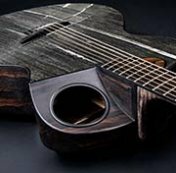 If you’re looking for guitar that nobody else makes, then you’ve come to the right place! This is where you can see what demons have possessed us! For instance, there’s a guitar with a built-in sensor that controls 40 different effects just by moving you hand (Avantair, 2000). Or a guitar that’s really four guitars, while also functioning as a tiny travel guitar (Convertible, 2010). Or the one that has a top made out of stone, and which includes a completely new kind of construction (Truffer, 2013). How about a gold-plated bass with a continuous fingerboard, invisibly mounted electronics, and tuning gears that are attached on the back of the body (Golden Fretless Bass, 1997)? Or perhaps a guitar that was pimped out with 60,000 Swarovski crystals (Swarovski Jazzability, 2003)? You’ll see all of these and more in these pages! 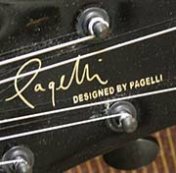 For several years now, we’ve been designing guitars for various manufacturers around the world, which then carry a «Designed by Pagelli» label. These are acoustic and electric instruments that feature our distinctive signature, while making it more affordable to play a Pagelli.